What is collaborative team mediation? Do I need a Trust? Peace Talks mediators are innovators, and have created a smart, humane, and cost effective way to complete a divorce in California. 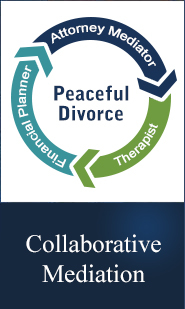 I highly recommend Peace Talks mediators and Peace Talks to anyone in need of mediated divorce services. Waiver: Will support for either or both parties be waived and terminated? Will there be a one-time lump-sum buy-out of either party’s support rights? Spousal Support for Either Party: If support will be paid, then you must resolve the following issues. Amount: What is the amount of monthly support. Term: How long should the support continue? Should there be an absolute termination, indefinite support, a review of support on a particular date, or a date for termination unless a motion is brought to extend support. In the alternative, support can be set at $0, but the court can still have the right to order support for either party for good cause for some transitional period. Vocational Issues: Is either party under or unemployed? What is the requirement for that party to obtain training and employment? What are the income expectations for that party. Should reviews of that person’s employment progress be scheduled? Unpredictable Income: How should bonus, seasonal or other unexpected or unpredictable income be factored into support? Tax Consequence of Support: Is one party a beneficiary of the other’s medical insurance policy? How is that party going to be insured after the divorce is final, and who will pay for that coverage? Are there problems with insurability? Person paying support fails to pay or disappears. Anticipated rate of return if lump sum was invested. Decreased anxiety associated with ongoing litigation. Don’t forget to add: the cost of litigation in order to find out what the spousal support order will be if you cannot settle on the terms. The marketable skills of the supported party; the job market for those skills; the time and expenses required for the supported party to acquire the appropriate education or training to develop those skills; and the possible need for retraining or education to acquire other, more marketable skills or employment. The extent to which the supported party’s present or future earning capacity is impaired by periods of unemployment that were incurred during the marriage to permit the supported party to devote time to domestic duties. The extent to which the supported party contributed to the attainment of an education, training, a career position, or a license by the supporting party. The ability to pay of the supporting party, taking into account the supporting party’s earning capacity, earned and unearned income, assets, and standard of living. The needs of each party based on the standard of living established during the marriage. The obligations and assets, including the separate property, of each party. The duration of the marriage. The ability of the supported party to engage in gainful employment without unduly interfering with the interests of dependent children in the custody of the party. The age and health of the parties, including, but not limited to, consideration of emotional distress resulting from domestic violence perpetrated against the supported party by the supporting party where the court finds documented evidence of a history of domestic violence, as defined in Section 6211, against the supported party by the supporting party. The immediate and specific tax consequences to each party. The balance of the hardships to each party. The goal that the supported party shall be self-supporting within a reasonable period of time. Except in the case of a marriage of long duration as described in Section 4336, a “reasonable period of time” for purposes of this section generally shall be one-half the length of the marriage. However, nothing in this section is intended to limit the court’s discretion to order support for a greater or lesser length of time, based on any of the other factors listed in this section, Section 4336, and the circumstances of the parties. Any other factors the court determines are just and equitable. I would recommend Peace Talks to anyone needing mediation. Peace Talks mediators can be counted on to handle a referral with care. © 2008 - 2019 PeaceTalks. All Rights Reserved. Peace Talks Mediation is a full service mediation firm that specializes in helping people in Southern California settle their divorce in a sane and sensible manner. Our divorce lawyers service clients in Los Angeles, Culver City, Beverly Hills, Santa Monica, Venice and Southern California. Our divorce mediators ensure that your divorce is handled amicably. Divorce mediation is 90% less expensive than a traditional divorce in Los Angeles and is completely confidential. 8055 W. Manchester Avenue #201 | Playa del Rey, CA 90293. Call us today to schedule an appointment with a divorce mediator or divorce lawyer in California at (310) 301-2100.